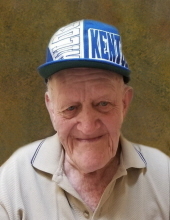 Glenn Noel, 83, of Bedford, KY, passed away on February 2, 2019, at Kings Daughter’s Hospital in Madison, IN. He was born on July 2, 1935, to the late Goldie Noel Wainscott in Owenton, KY. In his younger days, Glenn enjoyed playing basketball and softball. He grew up on a farm which lead him to work in tobacco most of his life. Glenn served as Resident Council President at Signature Healthcare of Trimble Co. He was inducted into the Signature Healthcare Café Hall of Fame on November 2018. A few of his hobbies were hunting, fishing, sports, gardening, painting, coloring and hanging out with his friends. Glenn was an avid UK fan. To send flowers or a remembrance gift to the family of Glenn Noel, please visit our Tribute Store. "Email Address" would like to share the life celebration of Glenn Noel. Click on the "link" to go to share a favorite memory or leave a condolence message for the family.